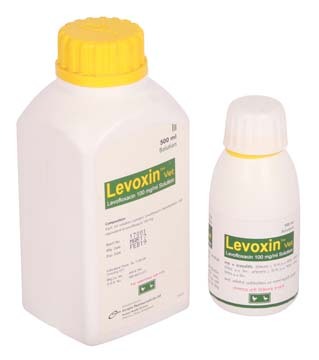 Levoxin Vet solution: Each 1 ml solution contains Levofloxacin BP 100 mg.
Levofloxacinis a dependable bactericidal and mycoplasmicidal drug. It is used in prevention and treatment of CRD. Enoxin Vet is an antibiotic of Quinolone group that inhibits the activity of bacterial DNA-gyrase enzyme, causes disruption of bacterial DNA replication & thereby causes bacterial death. Levoxin Vet is very effective against various gram positive and gram negative bacteria, Mycolplasma, Staphylococci, Streptococci, E. coli, Salmonella, Hemophilus, Klebshiella and Pasteruella. 1 ml per 1-2 litre of drinking water or 20 mg/kg body weight for 3-5 days. Levoxin Vet is well tolerated for poultry at recommended dose. However, it may cause developmental cartilage abnormalities. After the end of treatment, the watering system should be cleaned appropriately to prevent drug resistance. It should not be used for poultry resistant to any quinolone derivative because cross resistance may develop. It should not be used in layer within 14 days prior to laying period.